The tutors are a great help and seem to genuinely care about your work and sense of wellbeing on the course. Cyan Jordan talks about her plans for the future and her highlights while studying Textile Design. I was really impressed with the industrial links that NTU had and the opportunities we were encouraged to take advantage of; competitions, placements etc. After London universities, I felt that NTU had the best reputation so I was delighted to be accepted with an unconditional offer. It gave me confidence that I might actually be good! 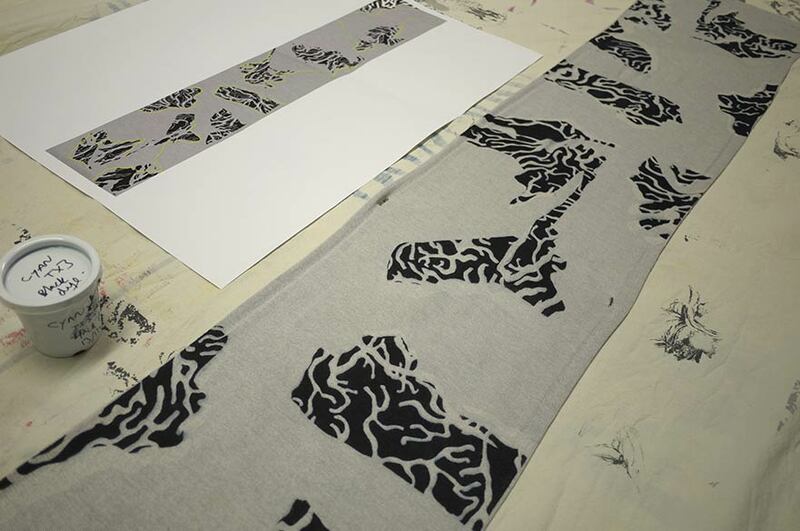 What did you enjoy most about Textile Design at NTU? I have enjoyed the breadth of ways we are encouraged to work in and the amount of support that we get from our tutors and also from our peers. It is such a positive surrounding to be in when you're under a lot of stress. In second year the live project was a great learning curve. Tailoring work to try and impress a client gave a real insight into how we will have to work in the future and encouraged me to take on work placements in the summer to gain first hand experience of the industry. The tutors are a great help and seem to genuinely care about your work and sense of wellbeing on the course. We are introduced to so many ways of working and encouraged to push them further in our own time. I've been on a few placements in industry and have found that I am perfectly equipped to work. Photoshop and Illustrator skills are particularly helpful. When on placement with George at Asda I got great feedback about being knowledgeable- which is encouraging for the future! I'm hoping to be selected to exhibit at New Designers and this will hopefully lead to some good things! I just want to design for a living – it's the only thing I want to do and approaching graduation I finally feel like I am ready to enter the design world.